Still remember the tremendous excitement you felt??? If I sit down and put my mind into being a child of the 1950's and still under the age of 10, I can still feel the exact excitement in me that I felt then! 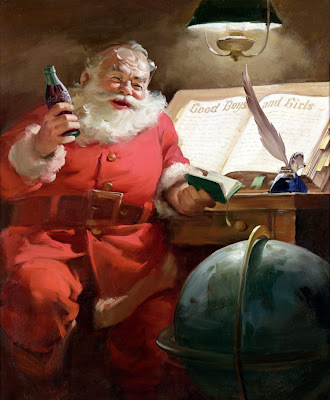 There was absolutely no other feeling like it and to be sure, those of us in the United States in those times of 1950's and 60's were truly blessed to have been born in this country and to have had parents who gave us that special, magical feeling of waiting each day and counting down the minutes for Santa to arrive! I can still feel my heart racing as I was put into my bed on Christmas Eve because Santa would be there soon. I KNEW that there was NO WAY I would be able to fall asleep...but somehow...before I knew it, I did... and the next moment it was Christmas morning and as soon as my eyes opened, I shot out of bed and downstairs and was amazed beyond words that I can find here and now..to describe what it was like to see the presents and warmth, love and wonderment presented to me when I went downstairs! We weren't a family of money but it didn't show and it didn't matter. There were plenty of presents and any particular wishes I had for certain items vanished after I started opening whatever I received. Christmas wrapping was flying and toys were making beeps and motor sounds. I was oblivious to anyone else waking and coming downstairs and opening their presents. I was in my own world of sheer toydome ecstasy!!! As most Baby Boomers, I did my best to give my children some of that same magic for their Christmas life long memories. These are memories that spring emotions that can not be taken away and that we will never lose. All we need do is take a few moments when we perhaps spy an old ornament on our Christmas tree that we have held onto since our youth. I have some of these ornaments that must be nearly 70 years old as they belonged to my parents when they were young. Each one of these ornaments contains special memories that can start your own "YouTube" video moments within your own mind of someone's smile or a laugh that occurred in your parents house when you were little, perhaps while hanging that ornament on the tree. There are so many reasons why this time of year raises our emotions to extremes. This can also bring many sad memories for any of us who have lost precious loved ones, especialy if more recently. There are no comforting words for those who may have recently lost someone during this time of the year with the exception that only time can heal these pains...and they do heal, eventually and the wonderful memories of our loved ones remain and you relive them each year you put up that tree again or remember those magical moments waiting for Santa when you were young and innocent and happiness was more instantaneous. So whether you still have young children or grand children or you just want to relive being little again...check out a few Santa sites and see where Santa is being tracked during the "special night"! Let me just make a note here that this is a special memory of love and family of mine that I feel confident can be shared amoung so many of us Baby Boomers and is by no means any reflection on any religious beliefs. There are many ways of celebrating this time of the year and although Christmas is a traditional Christian holiday, what this article is about is youthful memories of family and love and happiness that many of us can all share and feel and these emotions are blessings that have no religious or cultural bounds but are human blessings of tolerance and understanding and above all...LOVE! Happy Holidays to all and may we all learn to make tomorrow and next year one of Peace and Love and Understanding of ALL others!!! Wonderful post from a fellow Pittsburgher. You gave us warm and rich nostalgia, just the right concoction for a winter's day like this. It is a very special time of the year! I do have fond memories of Christmas in the past and I just love being around the good energy. I only wish we could all carry this "magic" with us throughout the rest of the year! Peace, happiness, and family are not just for Christmas, but for all times... Thanks for sharing! Thanks for your comment and for being a reader! The cool thing about being a child growing up back then is I had no idea we were poor because at Christmas it never felt like it. I truly believe the gifts we received were so special because they came from "love." By the way David, I am so enjoying your music! Thanks for your comment Beverly. I totally agree! Thanks also for your support and listening to my music. I wish you and your family health and happiness for 2009. Happy New Year!